The Russell brothers –Charles, Franklin, Hezekiah and Solomon N. – moved to Pittsfield as young boys with their family in 1822, just as the town started to shift from an economy based on farming to manufacturing. In 1845, they bought a small factory for carpenters’ tools that stood on the site of what was once an iron forge on Onota Brook that fed into the western branch of the Housatonic River. They converted this small building for the production of cotton batting which we know as the soft fabric that quilters use as a layer under the patchwork. It was likely the impact of the Civil War on the cotton-producing states that drove the brothers to build on these same premises a new three-story woolen mill in the middle of the Civil War. The demand for wool, especially from government contracts for uniforms and soldiers’ blankets, proved large enough to support another woolen mill in the town. With new equipment, the Russells were able to capture a significant size of the wool production, employing over 125 people in the years following the Civil War. By all accounts, the Russell brothers were both colorful and charitable with their fortune. Solomon became active in city government; in his will, he left the land on North Street for the House of Mercy, the precursor to the hospital in the same location. Hezekiah left Pittsfield on an 8-year adventure that took him out west and then on to a detour to Australia and back through Europe to return to Pittsfield to help out in the family business. Despite such peripatetic interests, the Russell mill was a going concern with a workforce of 250 at its peak in the late 1800s, but the deaths of the brothers led to a selling off of assets in 1941 to Kinney Woolen and Worsted Yarn and then to Elmvale Worsted Company. The building continued to function as a woolen mill until 1960, one of the last woolen operations in the county. Russell Mill stands south of Pecks Road on Onota Brook and across the street from the Catholic Cemetery. The mill has been successfully readapted as a warehouse and retail outlet for fabrics. 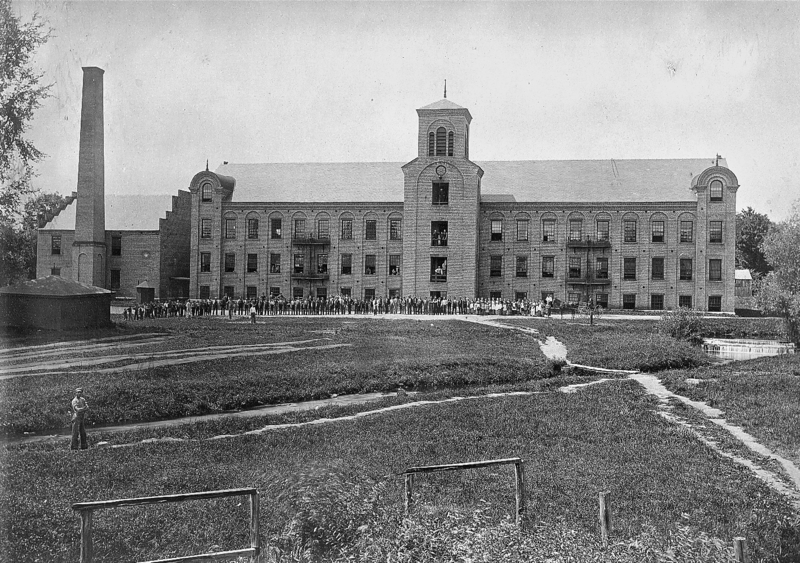 Its main building features many unique design elements, including a prominent stair tower off-center on the front façade and arched lintels on the recessed windows, with multiple outbuildings for a machine shop, a store and warehouse. The presence of two other mills on Onota Brook made for a populated settlement with sufficient tenement housing for the large workforce, some of which still stand.